The final work platform, A north, was lifted, installed and secured on its rail beam on the north wall of High Bay 3 inside the Vehicle Assembly Building (VAB) at NASA’s Kennedy Space Center in Florida on Jan. 12. The installation of the final topmost level completes the 10 levels of work platforms, 20 platform halves altogether, that will surround NASA’s Space Launch System rocket and the Orion spacecraft and allow access during processing for missions, including the first uncrewed flight test of Orion atop the SLS rocket in 2018. The A platforms will provide access to the Orion spacecraft’s Launch Abort System for Orion lifting sling removal and installation of the closeout panels. 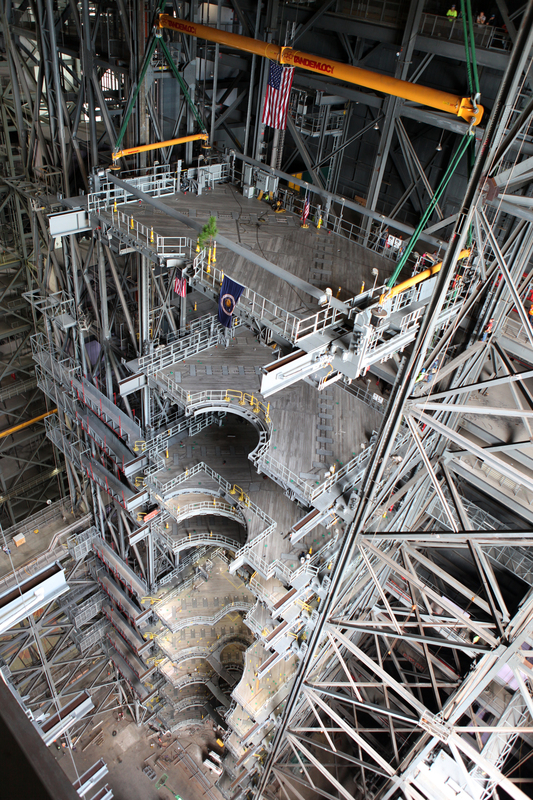 The Ground Systems Development and Operations Program, with support from the center’s Engineering Directorate, is overseeing upgrades to the VAB, including the installation of the work platforms.